SOUTH LAKE TAHOE, Calif. — Two earthquakes struck early Wednesday near Lake Tahoe, and their rumblings were felt across areas of two states. There were no immediate reports of problems. The U.S. Geological Surveys says the two magnitude 5.7 temblors were both centered in a remote area of Nevada near the California line, about 70 miles southeast of Lake Tahoe. The moderate quakes, which struck at 12:18 a.m. PST and then four minutes later, were followed by a series of smaller aftershocks. The Mineral County Sheriff's Department in Hawthorne, Nevada, near the epicenter, says staffers felt both quakes, but they have not had any reports of injury or damage. The office says the quakes apparently did trigger burglar alarms at two businesses, and caused a rock slide that did not block a nearby highway. In addition to Lake Tahoe, the USGS says the quakes were felt in such areas as Carson City, Nevada, and Yosemite National Park and Mammoth Lakes in California, all roughly 60 miles from the epicenter. The first temblor, with a magnitude of 5.7, occurred at 12:22 a.m. near Hawthorne, Nev. It was followed by a second 5.7 quake and then more than 100 aftershocks. Light shaking was felt as far away as South Lake Tahoe, Fresno, Visalia and Merced. The U.S. Geological Survey said most of the responses to its “Did You Feel It?” website came from the Central Valley and Sierra Nevada. But residents reported they felt the quakes as far west as San Francisco and as far south as Bakersfield. On social media, those near the first quake reported a sharp jolt. The epicenter was in a fairly remote, scarcely populated area of Nevada away from larger population centers in Reno and Lake Tahoe. Hawthorne has a population of about 3,300. Hours later, temblors continued near Hawthorne, with four quakes between magnitude 2.8 and 4 occurring after 4 a.m. A magnitude 3.5 quake was reported at 6:45 a.m.
As the morning progressed, the smaller and less frequent aftershocks continued. The California Office of Emergency Services said it was assessing the situation, but there were no reports of serious injuries or damage. According to the USGS, the 5.7 quake's epicenter was 56 miles from Gardnerville Ranchos, Nev., 69 miles from South Lake Tahoe, Calif., 70 miles from Carson City, Nev., and 84 miles from Fernley, Nev.
Seismologist Lucy Jones said on Twitter that multiple quakes like Wednesday morning’s are not uncommon in the region. She noted that in 1980, Mammoth Lakes experienced several quakes in the magnitude 6 range in one day. That swarm of quakes, which lasted several days, became the subject of much research. Jones said a bigger quake was possible but increasingly unlikely. “They could be foreshocks but [it’s] much more likely that we've already seen the largest. Sequence decaying normally,” she wrote on Twitter. In the last 10 days, there have been eight earthquakes of magnitude 3.0 or greater centered nearby. Another significant earthquake shook northwest California earlier this month. On Dec. 6, a magnitude 6.5 quake occurred off the coast of Eureka. That quake caused no damage. Later Wednesday morning, a 4.1 quake occurred in the Morongo Valley in the Inland Empire. Two moderate earthquakes shook areas across Nevada and California Wednesday, according to reports. 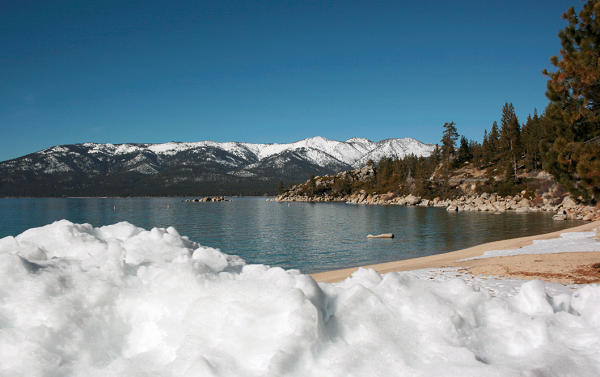 The quakes were felt near Lake Tahoe and surrounding areas across both state lines. The two magnitude 5.7 earthquakes, which struck at 12:18 a.m. PST, were initially struck in a remote area of Nevada not far from the California state line. Rumbles were felt in areas extending as far as 70 miles southeast of Lake Tahoe, according to the U.S. Geological Survey. A series of small aftershocks, with about seven reaching magnitudes between 3 and 5.6, were felt across both states about four minutes after the earthquakes ended. Light tremors were felt as far away from the quake’s epicenter in areas of California, including Fresno, Visalia and Merced. The quakes were felt the strongest in Hawthorne, Nevada, near the epicenter. Although the Mineral Country Sheriff’s Department in Hawthorne said in a statement that both quakes and aftershocks were felt, no damage or injuries had been reported following the earthquakes. The quakes did cause a rock slide on a nearby highway. However, the fallen rocks did not block off the highway. Authorities also said the earthquakes set off burglar alarms at two establishments. Along with Lake Tahoe, tremors were felt in Carson City, Nevada, and about 60 miles away from the quake’s center in Yosemite National Park and Mammoth Lakes in California. Within the last 10 days, areas near Lake Tahoe have experienced eight earthquakes reaching magnitude 3.0 or higher. In Hawthorne, residents told local media a string of small earthquakes shook the ground back in July while NASA’s Earth Observatory said several earthquakes rumbled areas surrounding Hawthorne for weeks at a time back in March and April 2011. About 400 “small and medium-sized earthquakes have been concentrated near Buller Mountain, in an area about 10 square kilometers (4 miles),” reaching magnitudes between 1.0 and 4.6, the observatory said at the time. 0 Response to "2 quakes hit near Lake Tahoe, rumblings felt across region"